Money Shot Video Slot Guide & Review - Casino Answers! Money Shot is a 5-reel, 20-line video slot developed by Vegas Technology. It features wild symbols, scatter wins, free spins and a bonus game. You can play Money Shot at Bovada. Bets on Money Shot are $0.01, $0.05, $0.10, $0.25, $0.50, $1, $5 and $10 per line. As there are 20 lines, the minimum bet is $0.01 and the maximum bet is $200 per spin. Money Shot is great for low and high stakes casino players. 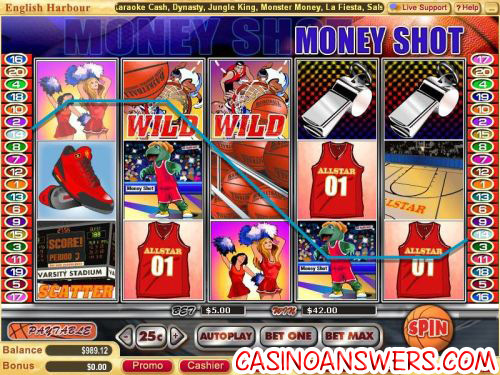 Casino Answers recommends that you play Money Shot with all 20 lines active at all times. You don’t want to miss any big wins. To play all 20 paylines and spin the reels automatically, use “Bet Max.” To change the active paylines, you can either hit “Bet One” or click on the numbers at the sides of the screen. 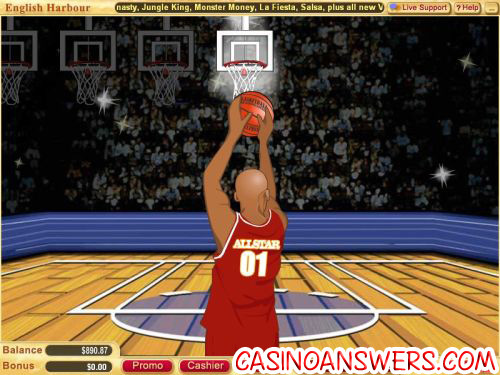 To play Money Shot, set your bet and number of lines and hit the “Spin” button, which is in the form of a basketball. The reels will then spin and if they land on a winning combination, your account will be credited immediately. Also, you will be notified by the music and sound effects that play when you win. The top jackpot on the Money Shot video slot the wild symbol at 10,000X. The wild symbol is a game action symbol of a basketball player dunking the ball into the net. Your prize is doubled when one or more wild symbols complete a winning combination. The wild symbol will substitute for any symbol in the game except the scatter and bonus symbols. The scoreboard symbol is the scatter symbol. Hit three or more scatter symbols and you will win 15 free spins. All wins, including bonus, are tripled during free spins. Additional free spins can be won a free spin. You can win free cash from the Money Shot casino game at Bovada! Money Shot also has a bonus symbol – a basketball. If the bonus basketball symbol appears on both reels 2 and 4, you will trigger the bonus game. The bonus round prize will be multiplied by the number of paylines crossing through. In the bonus game, you are a basketball player taking a free throw. You must choose which net to shoot the ball into. Each net will win you a different prize. Money Shot’s bonus game is easy to play, offers the chance to win some sizable prizes and is triggered with reasonable frequency. For players who want to play a lot of spins at a time, Money Shot has an autoplay feature. You can determine the number of spins (5, 10, 25, 50, 100, 250 or 500), the number of seconds between spins (1, 1.5 or 2), to stop once all spins are complete, to stop when the jackpot is won, to stop if a win exceeds or equals (50, 100, 150, 200 or 250) and to stop if credits are increased/decreased by (50, 100, 150, 200 or 250). You can stop autoplay at any time. Money Shot is a good video slot. It’s not spectacular, but it gets the job done. The bonus game is fairly basic, but that’s all it needs to be. If you like shooting hoops, we think you’ll also enjoy spinning Money Shot’s reels. If you’re looking for the right Vegas Tech casino to play Money Shot at, Millionaire Casino offers a $5,000 signup bonus on your first three deposits. Go for the money shot at Bovada! Can I find Money Shot at US-friendly online casinos? Yes, all of the casinos that have Money Shot are infact US-friendly. US players are welcome to sign up at Millionaire Casino. Do I need to download any software to play Money Shot? Millionaire Casino offers both download and instant play versions of their casino and Money Shot is one of the many games offered on the instant play version. If you don’t have Flash installed on your computer, you can download the newest version of Adobe Flash Player. What sport slot machines are there? What basketball slot machine games are there? Are there any slot machine or fruit machine games based on the NBA?